Normally, when it comes to traveling at high speed, we usually think of powerful cars or motorcycles and certainly not think of a bicycle. 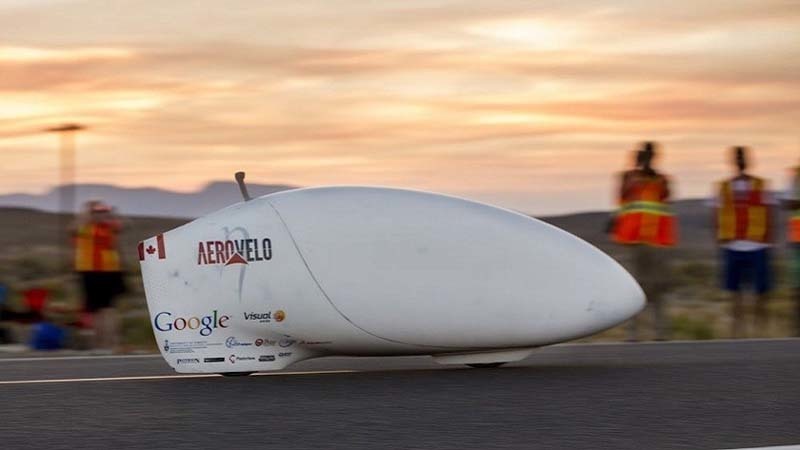 Recently it has broken the world record on two wheels, reaching the 142 Kilometers per hour. It was achieved in a competition held on the road 305 of the Nevada desert, It is chosen not only for its length but also so smooth that is. The team Aerovelo, with his engineer Todd Reichert arrived at that speed, it was exceeding its record in 138,45Km / h.
The event where the record was achieved is called World Human Powered Speed Challenge and it takes place on a road having about eight kilometers asphalt. Each rider and his team of engineers, They present some of their speedbikes or fast bikes and recumbents or recumbent bikes for the less downforce and have the opportunity to beat a speed record. This event is held for seventeen years and always truly original ideas that can help achieve high speeds are presented to runners, who must be fully fit and have all available security measures to avoid a misfortune. In this year's event they were presented 23 brokers ten countries. Many of them chose to remove the windshield of your bike to reduce air resistance offered by fairings. All of them follow the path through glasses connected to cameras at the front of the bike. So far they have advanced the work engineers do with this kind of bike will not sell but seek awareness of people about the importance of the use of means of transport that are environmentally friendly and help reduce consumption Energy.